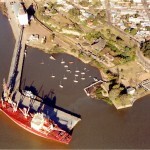 Situated on the left bank of the River Uruguay, 171 n. Miles by river from Montevideo and 145 n. Miles from Buenos Aires. In 1976 a bridge was inaugurated, spanning the river at km 101 and linking Uruguay with Argentina. The bridge is 5366 m long and the center span is 220 m with a reported clearance of 40 m above the river. To arrive at Fray Bentos from the River Plate, ships normally proceed via the Martín García Channel. From km 0 of the Uruguay river there are four passes, Paso Márquez Punta Caballo, Punta Amarilla and Paso Barrizal, with of about 5,40 m at datum. Both passes are of silt. A safe draught for navigational purposes is dependant on prevailing river water level and is usually around 5,80 m. Pilots and Agents should be consulted beforehand in this respect. At Fray Bentos, port facilities consist of an “L” shaped pier built of reinforced concrete offering two berths, together with a grain elevator, connected by conveyor belt to the first section of the pier. The first section of the pier, for domestic trade Muelle Fluvial) runs out from the shore in a westerly direction, is 225 m long, 22 m wide, depth alongside 7,30 m, fitted with railway lines and is equipped with an overhead grain conveyor belt which runs from the elevator situated at the head of the pier. A rail mounted loading tower receives the grain from the conveyor belt and can be positioned as required in front of the hatches to be loaded, a chute being lowered from the tower out over the vessel for that purpose. Loadrate about 500 TPH. Elevator storage capacity 20.000 ton. This quay is also used for loading other cargoes, nowadays principally citrus, although of course to some extent loading is hampered by the pillars supporting the overhead conveyor belt and which are stepped onto the quay. Tugs are not used either for berthing or unberthing, however some difficulty can be experienced on sailing if a northerly wind holds the vessel onto the quay. The second section of the quay, for ocean going vessels, lies at an obtuse angle to the first section and exten ds in a SW direction for 200 meters, 43 m wide. This quay, also of reinforced concrete, is an open quay with two sets of railway lines. The railway lines run alongside the sides of the pier, thereby allowing wagon cargo to be stood off the rear of the pier and supplied alongside using F/L trucks. Depth alongside these berths is about 9,00 m at datum however sailing drafts are usually not more than around 7,00 m and of course depend on the least depths in the river passes. At Fray Bentos depths of 1,20/1,30 m above datum are usually recorded, however with a northerly wind, which albeit is infrequent, this can drop to around 60 cm (2 ft). On the other hand, a SE gale (Sudestada) off the River Plate can cause the river level to rise to around 1,80/1,90 m above datum. In all cases of sailing drafts above datum figures, pilots should be carefully consulted beforehand .During 2011, cargo movement:was 109.354 tons. Only MGO/DO coming from Montevideo by trucks. Highway to Nueva Palmira, Carmelo, Colonia and Montevideo. Regular bus services. Railroad to Montevideo. Between kms 92 and 96 River Uruguay. Is compulsory. 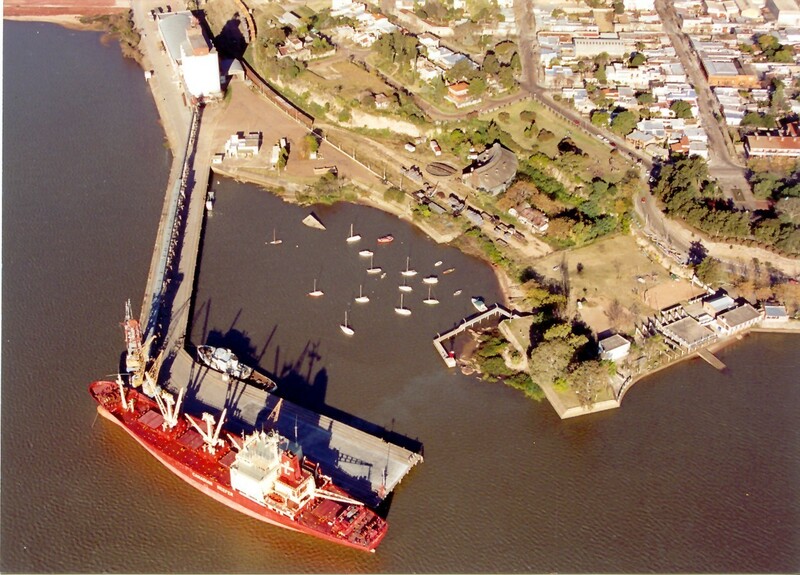 Vessels inbound from Atlantic Ocen take a Uruguayan pilot at Montevideo roads and at Uruguayan ports they use the Uruguayan Pilots Service; if coming from Argentine ports vessels use Argentina river Pilots and Uruguayan port pilot. Only minor repairs can be effected. (Technicians coming from Montevideo).